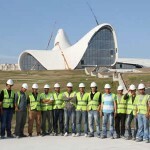 Heydar Aliyev Centre having an awarded project with the architectural design made by Zaha Hadid Architects shall be made a distinctive appearance for Baku-Azerbaijan. The complex that has been dedicated to the founder president of Azerbaijan shall serve to the guests with a conference hall, auditorium, library, museum, restaurants and cafeterias. The project on a total construction area of 101.000 m2 is estimated that it shall serve as a symbol for both the city and the country.